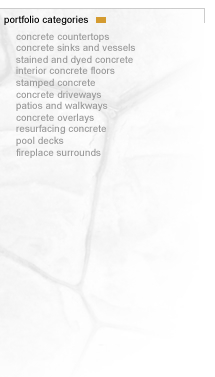 Distinctive Concrete Designs is dedicated to all types of decorative concrete products for both interior and exterior applications. We specialize predominately in custom concrete countertops, sinks, furniture, stamped and stained concrete and vertical and horizontal overlays. We are qualified to service your residential and commercial environments. Whether you are in need of a new patio or driveway, or simply want to update your interior floors, we have the perfect solution for you.